Where does Power Girl fit into DC Comic’s New 52? I, like many others, have been a bit mystified as to what The New 52 is all about and where Power Girl might fit into the larger picture. Well, I was at my local comic book shop this weekend and got the latest scoop from my fellow readers, and now everything is making a whole lot more sense. As well, although I’m a bit new to reading Power Girl, I totally love her, and have been catching up reading trade paperbacks of much, much older issues. Anyway, I think I'm understanding just a bit better where DC is going with the larger stories, especially as they relate to Power Girl. Someone called “Reverse Flash” (an evil version of the Flash) who’d been trying unsuccessfully to kill the Flash, as an alternative since he couldn’t seem to kill him, decided to travel back in time and change just one thing. Once he changed that one thing, the individual who had become the Flash still existed, but he just doesn’t end up becoming the Flash. 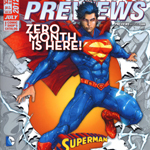 As well, that one change also appeared to affect things and people throughout the entire DC Universe. Essentially, the Flashpoint story arc causes most everything to change slightly everywhere, thus the opportunity now to re-tell all the early superhero back stories, but in a slightly different manner — thus the resetting of all the edition numbers to #1! Talking to folks though, it sounds like that in the course of the New 52, some one or group are going to finally figure out what was done, go back in time, and restore the larger universe to how it was before — and thus the chance for DC to restore the numbering system to it’s usual. Anyway, I thought that this was a novel approach to their storytelling and marketing and am actually now looking forward to the New 52 in ways I hadn’t in that the characters I know and love are not going to be done away with on a sickening whim of non-linear juxtapositioning, but that there actually is a bit of logic behind it all. Yay! 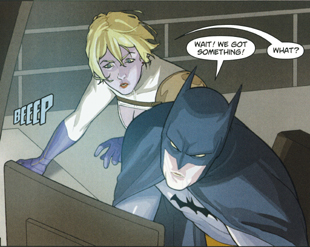 In another vein, what might this mean for Power Girl? As I’ve been reading the trade paperbacks, they reveal that Mr. 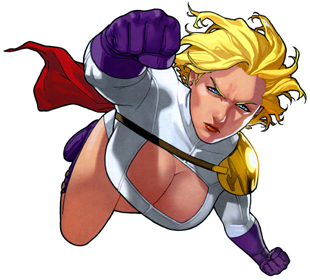 Terrific has been a related figure to Power Girl throughout her more recent history, including sometimes as she was trying to figure out her own origins and such, which have been quite a bit nebulous at times in her life, though it appears that DC has sought especially in recent years to establish her as Kryptonian. 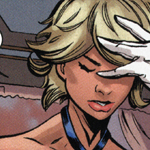 Also, Power Girl is actually from an alternate universe and so if Negative Flash went back in time and changed something that affected the whole universe, Power Girl’s history in the universe she’s from would probably not be affected. Her entering our universe and all her convoluted searching to figure her history out while here would honestly be a whole lot that I would not want to have to explain post-Flashpoint if I was a comics publisher. I’d just think to do this retelling, switch the universe back to normal, and move on. Many of us have heard the announcement by DC Comics that “Karen Starr” will be in the new Mr. Terrific title being released with The New 52. I am told that Mr. Terrific has had his own title before, but, for Mr. Terrific to have his own title again for a while exploring his own history, or even a contemporary, altered present-day, with Power Girl as a part of that picture, might help us see their working relationship or otherwise in new and interesting ways. And, it sounds rather fun to me to perhaps explore that; I’m actually looking forward to it. Karen Starr in the iteration we know and love, has her own high-tech company which kind of falls apart. In a slightly alternate present-day, maybe Mr. Terrific helps get her company back on it’s feet, or they end up teaming up a whole lot more often against bad guys, though Power Girl herself is so independent in so many ways, maybe that won’t work too well. What’s for sure is – we’ll see. 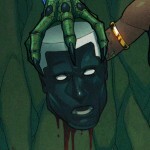 3 Responses to "Power Girl in The New 52"
Fantastic blog. Keep up the good work. The site looks great. 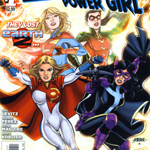 Finally a site dedicated to Power Girl. I was really upset when PG wasn’t announced in the 52 lineup. But reading your outlook on PG made me feel a lot better. Hopefully they will bring her back in a solo book.